Whether you need hardware for new or retrofit installations, from residential to heavy commercial and institutional applications requiring ADA compliance, we can supply just the right knobsets, leversets, mortise locks and exit devices. 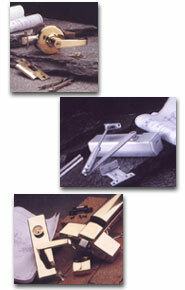 We stock a wide range of door closers and controls, plus standard or full surface or power transfer hinges. Add accessory hardware: latch protectors, push plates and pull handles, wrap around and door filler plates, surface and concealed bolts, door viewers and much more.